Note: Most of the links on this page bring up images of the topic being discussed. A new page will open. This method is used due to space considerations. Clicking on an image will bring up a 1024 by 768 version of the image. Jerusalem is a fantastic city of contradictions: ancient yet modern, pluralistic yet monolithic. My original purpose for being there was to present information at Yad Vashem on the art of teaching about the Holocaust using the Internet, but I knew there would be much more to learn as we toured Jerusalem. 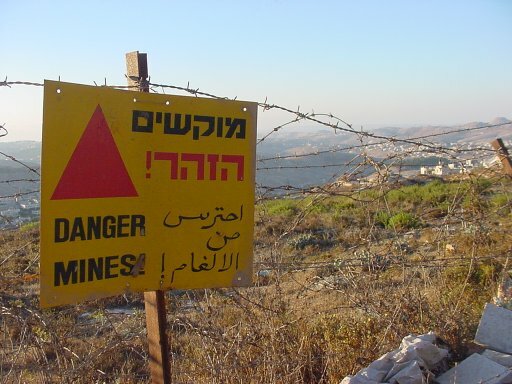 The trip from the Ben Gurion Airport in Tel Aviv was uneventful and fascinating as we drove through the Judean hills towards our hotel, which seemed to be on the edge of Israeli-held territory, overlooking what looked like the occupied West Bank. Our hotel is actually part of a kibbutz at Ramat Rachel, which was situated just southeast of Jerusalem, overlooking Palestinian settlements in what appeared to be a modern Bethlehem. One could not help but think the long structure in the image at left was the security wall the Israelis were in the process of building. The wall is symbolic of the inner conflict within the soul of Israel: how to be a pluralistic democracy when surrounded by hostile neighbors; indeed, how can Israel contribute to the peace process if it feels the need to occupy territory obtained militarily a quarter-century ago? Our first foray into the Old City was at night. We were assigned a tour guide and a young Israeli soldier who carried what looked like was an older carbine-style rifle. Security was tight around the city with soldiers placed at the main gates and at historical sites, and these on-duty soldiers were equipped with high-powered machine guns, ostensibly Israeli-made Uzis. We entered the Old City through the Zion Gate, which is linked to a wall build during the Ottoman Empire period in the 1600s. There were bullet holes visible in the wall, but it was unclear which conflict generated these indentations. We walked through the Jewish Quarter of the Old City, arriving at the Wailing "Western" Wall. It was impressive at night, but I knew we would have to return to see the Dome of the Rock and the remains of the Second Temple during the day. Our first impression of the Wailing Wall was that we were standing in a place of considerable religious significance. Unless you were fully familiar with the history and religious rituals of the place, you could feel quite intimidated by the power of the emotions present there. Many orthodox Jews had come to the wall to pray and ask God for blessings, some of which were written down and placed between the stones of the temple ruins. It was overwhelming to know you were standing at a source of tremendous energy, a place where ancient and modern history had recorded many tumultuous events. It was in that very square that Israeli forces recaptured the Temple Mount in 1967, bringing about the capture of what would become Israel's spiritual and political capital, and bringing about the ire and anguish of many Muslim Arabs, especially the Palestinian people. Our group continued through the Jewish Quarter, passing some well preserved Roman ruins, but never venturing into any part of the Arab or Armenian quarters of the city. Naturally, the safety of the tourists could not be guaranteed once we ventured into those sections, so we would save our visit to those sites when we were not part of a tour group. We ventured up to the heights overlooking the city by walking along a wall and railing, so eventually we were overlooking the Mount of Olives with a beautiful nighttime view. My brother and I made the trip into the Old City once again later that week but during the day. We experienced the Jerusalem cabbies with bravery, but they were gentle drivers. Most often Arab in ethnicity, I took the chance of asking them how they felt about living in Israel. Both were Israeli citizens. One was complacent about his station in Israeli society, content to be a cab driver, not really interested in politics. Another was more vocal, more outspoken about feeling like a second class citizen as a Muslim Arab in a nation designated as "The Jewish State." My brother wanted me to end the conversation, so I did not pursue it, but I wanted to know how Israelis, both Jewish and Arab, reconciled their status as the Jewish homeland with the presence of non-Jewish citizens in their midst. Once we found ourselves in the Old City again, it was up to us to find the Via Delarosa, or "Way of Pain." It was here that Jesus walked with the cross to Golgotha where he was crucified. I had heard about the "Jerusalem Syndrome," where tourists found themselves in a state of spiritual ecstasy because of their proximity to the footsteps of Jesus. I wondered if I would be overwhelmed with emotion as we traced his steps. Instead, we were overwhelmed by offers of purchasing the locally-made trinkets cheap by storekeepers on every side. One storekeeper used his knowledge of the Old City to give us a special look at Jerusalem that most tourists would not get. He was a Bedouin Christian Arab who asked us to call him "Al," and he had a great commend of English and of western culture. He said he had lived in the United States for a while, and that he still had family there. He quickly took up up the steps behind his shop to the rooftops overlooking the Arab Quarter. 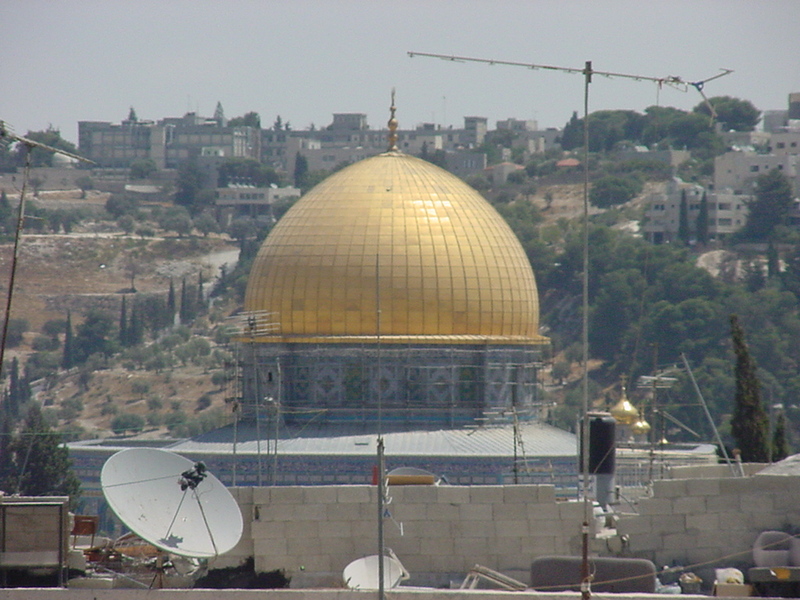 Again the ancient and the modern were in stark contrast: the Dome of the Rock was clearly visible, but it was surrounded by satellite dishes and TV antennae peering above the Jerusalem shops. These aspects of modern technology were not visible from the small alleyways of the Arab Quarter. My brother recognized the significance of the moment as we stood near the Wailing Wall. 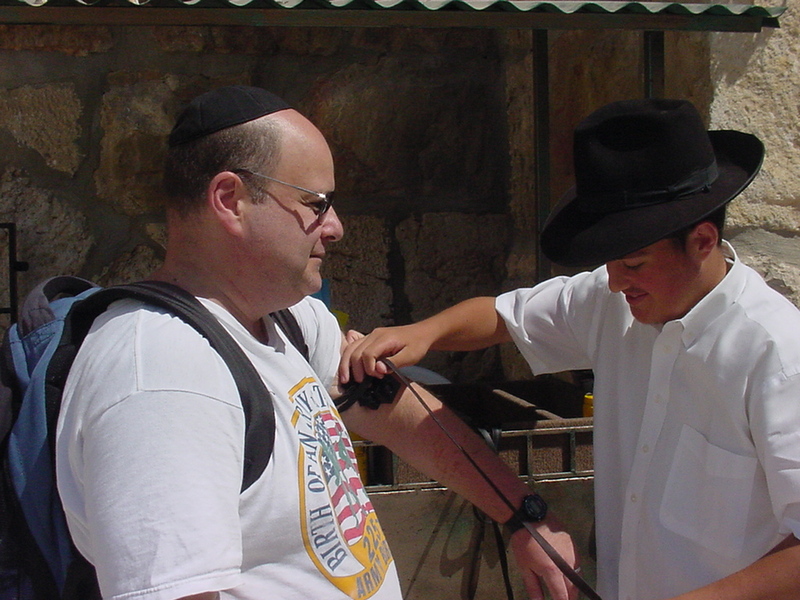 We were approached by a young Jewish activist, a member of the Lubavitcher sect, whose stated goal was to help Jews fulfill their religious heritage by providing them with the tools to pray properly while at the holiest site in Judaism. He offered my brother the leather boxes known as phylacteries, with the straps orthodox Jews use to place the scripture on their hearts and on their heads. I responded that I much more wanted to be the historian, the observer, but Ben took the religious items and said a blessing in Hebrew. While at the Wailing Wall, we also witnessed a bar mitzvah, the rite of passage of a young Jew from boyhood into manhood at the age of thirteen as well as a wedding party. We did make our way to the Church of the Holy Sepulcher, one of the sites where Christ was allegedly crucified. We entered the church, passing the heavily armed Israeli guard in the courtyard. The church was built by the mother of Roman emperor Constantine in the Fourth Century, but it was destroyed by invading Muslims, and later rebuilt. The passage of time masked the spiritual significance of the site. Rather than building the image Christian artwork portrays, where Christ was crucified on a barren hill, the church creates a more medieval scene, with its ornate decorations and fortress-like walls and chambers. 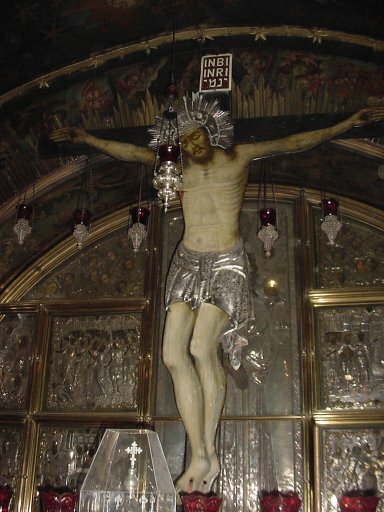 The statue of Christ crucified was moving, and we ducked into a small chamber where the body of Jesus supposedly lay. While standing there, it was hard to conceive of the idea that you were looking at the exact location where the Resurrection took place. No religious ecstasy seemed imminent. There was just too many layers of history surrounding the place to feel what millions found to be spiritual truth. Indeed, my own faith continued to require of me that I believe in what was not seen, that which was hidden by the years, the wars, the bricks and the bloodshed rather than what was physically before me in real time. Our journey took us around to the Christian Quarter, where the Jerusalem 's Tower of David Museum gave us an impressive panorama of the entire city. The museum integrated the modern and the ancient by incorporating the exhibits within the historic walls of the fortress. The museum is scattered within the walls of the Citadel of old Jerusalem, but from those walls the landscape of modern Jerusalem can be seen. Exhibits on the movement of people within the Middle East and the architecture of the Second Temple were just some of what could be learned by wandering the ramparts of the museum. Religion permeates the cultural atmosphere of Jerusalem. The three major "religions of the book" claim the city as their own, and this tension is palpable as you make your way through its narrow streets or broad avenues. 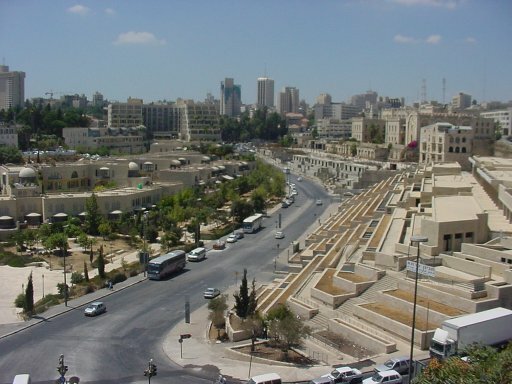 It is not altogether clear how the city will continue into the future as Israel's spiritual capital, the place where Christians call the birthplace of their faith, or the eventual capital of an independent Palestinian state. The ancient and the modern continue their quarrelsome marriage in Jerusalem, bringing with them all the memories and anguish that contentious relationships bring. If the city did become an "international city," as was once proposed, each religion and people would gain something, namely peace, but each would also lose a vital part of its identity. And so the tension of the three faiths, arising from centuries of history, continues.